We are counted amongst reckoned names in the industry, committed towards trading a broad gamut of Curtain Rods. We are successfully ranked amongst the top manufacturers and suppliers of Antique. Our offered products are stylishly designed and developed using best quality material and are highly durable in nature. Owing to features such as glossy finish and excellent patterns, these products are in wide demand. Moreover, these are accessible in varied style, color and texture at very feasible prices. Color : As shown in the photos. Price : Rs. 145.00 rft + Rs. 710 per set of Final. 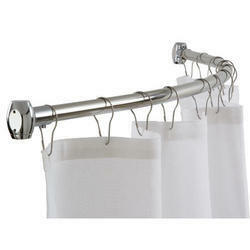 Backed by a team of adroit professionals, we are trading an extensive array of Curtain Rod Set.